At first glance, this graphic's message seems clear: what proportion of Americans are exceeding or lagging guidelines for consumption of different food groups. Blue for exceeding; orange for lagging. The stacked bars are lined up at the central divider - the point of meeting recommended volumes - to make it easy to compare relative proportions. The original chart is here, on the Health.gov website. The little icons illustrating the food groups are cute and unintrusive. It's when you read further that things start to get complicated. The last three rows display a flipping of the color scheme, with orange on the right, blue on the left. Up to this point, you may understand blue to mean over the recommended value, and orange is under. Suddenly, the orange is shown on the right side. The designer was wrestling with a structural issue in the data. The last three food groups - sugars, fats and sodium - are things to eat less. So, having long bars on the right side is not good. The orange/blue colors should be interpreted as bad/good and not as under/over. The problem with this design is that it draws attention to this color flip - that is to say, it draws attention to which food groups are favored and which ones are to be avoided. This insight is actually in the metadata, not what this dataset is about. In the following chart, I enforce the bad/good color scheme while ignoring the direction of good. The text is adjusted to use words that do not suggest direction. Dieticians are probably distressed by this chart, given that most Americans are lagging on almost all of the recommendations. In a final edit, I re-ordered the categories. In China, 2019 is the Year of the Pig. Half of the world's pigs live in China. This graphic is inspired by this BouncyMaps project, which generated the following cartogram. The best and the worst of data visualization share something in common: these graphics provoke emotions. 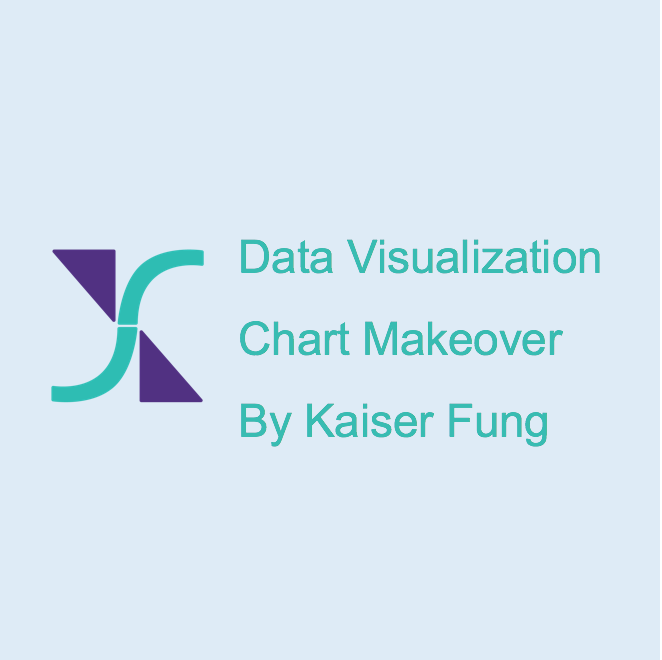 In this talk, I connect the emotional response of readers of data graphics to the design choices made by their creators. Using a plethora of examples, collected over a dozen years of writing online dataviz criticism, I discuss how some design choices generate negative emotions such as confusion and disbelief while other choices elicit positive feelings including pleasure and eureka. Important design choices include how much data to show; which data to highlight, hide or smudge; what research question to address; whether to introduce imagery, or playfulness; and so on. Examples extend from graphics in print, to online interactive graphics, to visual experiences in society. Now, on to the data visualization, which is primarily an exercise in rolling one's eyeballs. In order to understand the red and blue line segments, our eyes have to hop over the price bubbles to the top of the page. Then, in order to understand the vertical axis labels, unconventionally placed on the right side, our eyes have to zoom over to the left of the page, and search for the line below the header of the graph. Next, if we want to know about a particular country, our eyes must turn sideways and scan from bottom up. I transformed the data as I don't find it compelling to learn that Russian Big Macs are 60% less than American Big Macs. Instead, on my chart, the reader learns that the price paid for a U.S. Big Mac will buy him/her almost 2 and a half Big Macs in Russia. The arrows pointing left indicate that in most countries, the values of their currencies are declining relative to the dollar from 2017 to 2018 (at least by the Big Mac Index point of view). The only exception is Turkey, where in 2018, one can buy more Big Macs equivalent to the price paid for one U.S. Big Mac. compared to 2017. The decimal differences are immaterial so I have grouped the countries by half Big Macs. This example demonstrates yet again, to make good data visualization, one has to describe an interesting question, make appropriate transformations of the data, and then choose the right visual form. I describe this framework as the Trifecta - a guide to it is here. The chart does not deliver on its promise: It's tough to know which birds like which seeds. I can see why someone would want to remake this visualization. Let's just apply some Tufte fixes to it, and see what happens. First, consider the colors. Think for a second: order the colors of the cells by which ones stand out most. For me, the order is white > yellow > red > green. The white color still stands out more than necessary. Fix this using a gray color. What else is grabbing your attention when it shouldn't? It's those gridlines. Push them into the background using white-out. The visual is much improved. But one more thing. Let's re-order the columns (seeds). The most popular seeds are shown on the left, and the least on the right in this final revision. Look for your favorite bird. Then find out which are its most preferred seeds. PS. [7/23/18] Fixed the 5th and 6th images and also in the animated gif. The row labels were scrambled in the original version. This Buzzfeed article proves that foodies love their food served with dataviz (tip: Chris P.). Menus are an undertapped resource when it comes to data visualization. There are several examples worth discussing. Venn diagrams are not easy to read, people. Plus they are hard to construct well... note the asymmetric areas. Not enough space to explain the drinks. Don't the clients want to know what's in them? I wonder how they measured the degree of "classic"-ness. When the drink comes in one size, only one price is listed. If it comes in two sizes, two prices should be listed. Is the cafe owner shading Americans as not good at math? Another entry in the Google Newslab data visualization project that caught my eye is the "How to Fix It" project, illustrating search queries across the world that asks "how." The project web page is here. I particularly appreciate the lack of labels. When we see the pictures, we don't need to be told this is a window and that is a door. The search data concern the relative sizes of the appliances. The red dotted lines show the relative popularity of searches for the respective appliances in aggregate. Are the Russians more sensible? Their searches are far and away about the washing machine, which is the most complicated piece of equipment on the graphic. I have to confess that I searched for "how to make soft boiled eggs". That led me to a lot of different webpages, mostly created for people who search for how to make a soft boiled egg. All of them contain lots of advertising, and the answer boils down to cook it for 6 minutes. The Russia versus France comparison brings out a perplexing problem with the "Data" in this visualization. For competitive reasons, Google does not provide data on search volume. The so-called Search Index is what is being depicted. The Search Index uses the top-ranked item as the reference point (100). In the Russian diagram, the washing machine has Search Index of 100 and everything else pales in comparison. In the France example, the window is the search item with the greatest number of searches, so it has Search Index of 100; the door has Index 96, which means it has 96% of the search volume of the window; the washing machine with Index 49 has about half the searches of the window. The numbers cannot be interpreted as proportions. The Index of 49 does not mean that washing machines account for 49% of all France queries about fixing home appliances. That is really the meaning of popularity we want to have but we don't have. We can obtain true popularity measures by "normalizing" the Search Index: just sum up the Index Values of all the appliances and divide the Search Index by the sum of the Indices. After normalizing, the numbers can be interpreted as proportions and they add up to 100% for each country. When not normalized, the indices do not add to 100%. Take the case in which we have five appliances, and let's say all five appliances are equally popular, comprising 20% of searches each. The five Search Indices will all be 100 because the top-ranked item is given the value of 100. Those indices add to 500! By contrast, in the case of Russia (or a more extreme case), the top-ranked query is almost 100% of all the searches, so the sum of the indices will be only slightly larger than 100. If you realize this, then you'd understand that it is risky to compare Search Indices across countries. The interpretation is clouded by how much of the total queries accounted for by the top query. In our Trifecta Checkup, this is a chart that does well in the Question and Visual corners, but there is a problem with the Data.